Russian cyclists field their best squad at Tour de France. 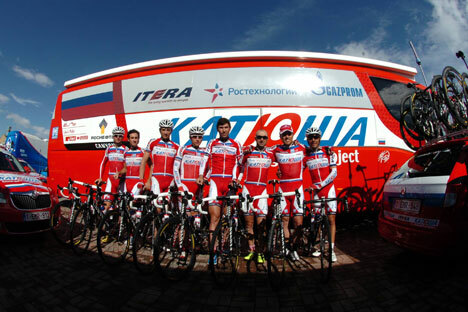 Russia’s Katusha is a professional road bicycle racing team that was set up in May 2008 with support from the companies Itera, Gazprom and Rostec. The team’s name—Katusha—is a beautiful female name with many historical associations in Russia. Katusha is now competing in the Tour de France race, which concludes on July 21. The team’s leader on the historic grand tour is the Spaniard Joaquim Rodriguez, who is a medal-winner in two other grand tours—the Giro d’Italia (second place, 2012) and the Vuelta a España (third place, 2012). In 2012, the Katusha team garnered 29 victories (16 of which were in World Tour races) and 51 medal places (21 of which were in World Tour races). Overall, Katusha has secured a total of 80 medal places (29 wins, 30 second places and 21 third places). “The Katusha team will field its strongest squad for the Tour de France,” said the Russian team’s sport director, Valerio Piva, before the start of the race. “The leader will be Joaquim Rodriguez, who will be aiming for success in the general classification. He’ll be supported in this by some strong climbers—Alberto Losada, Yuri Trofimov and, of course, Daniel Moreno, the number two in our team. In addition, the team includes racers who’ll be able to support and protect our leader in the flat stages—Pavel Brutt, Gatis Smukulis, Aliaksandr Kuchynski and Eduard Vorganov. “I’m expecting some good work from these racers on the flat, in the team race and in the breakaways. Katusha also has a strong sprinter in Alexander Kristoff. The Tour de France is three weeks of racing, and so each stage will be important. We’ve studied the majority of the key stages—especially the individual races—and so I believe Katusha is ready to compete,” said Piva. This year, the organizers of the “Big Loop” (as the Tour de France is known) have put together a very difficult route—possibly the most difficult of recent years. In the first place, the racers will be tested even in the first three stages in Corsica, after which comes the team race in Nice. The eighth and ninth stages will bring the peloton to the Pyrenees, where the first big battle for the yellow jersey in this year’s Tour de France will take place. Katusha was second in the team rankings in 2012. No Russian team had ever finished the year in the top three before (Katusha came in 10th in 2009, fifth in 2010 and 12th in 2011). Only one team is higher than the Russians in the world team rankings: Britain’s Team Sky. One of the key figures in the Russian team is the 31-year-old Leningrad Region racer Pavel Brutt—a protégé of the famous coach Aleksandr Kuznetsov. When necessary, Pavel breaks away from the pack. Or he works for the others. Or he wins. He has been involved in many international competitions, and, in 2011, the road racer won the Russian team racing championship. In the same year, Brutt won the Tour de Romandie in Switzerland. Pavel was born and raised not far from St. Petersburg and moved to Italy five years ago.